Two days ago, Event 13: $1,500 Limit Hold'em of the 2012 World Series of Poker began with 730, which created a $985,500 prize pool. On Thursday, the final 25 players in the tournament returned to competed for the gold bracelet and $211,921 first-place prize. It took nearly 11 hours of play, and in the end it was 66-year-old David Arsht who outlasted them all to win his first gold bracelet. The day started off with a bang as the eliminations came quick. Five players hit the rail in the first level alone, and before long it was down to just two tables. It was at that point that the fan favorite of the tournament, Jennifer Harman, was eliminated. She had grown short stacked and got her chips in preflop with and was up against the of Leonid Bilokur. It was an old-fashioned flip, but it didn't come down in Harman's favor as the flop fell . Bilokur paired his king to take a commanding lead, and Harman was left looking for a queen. The turn wasn't what she needed and neither was the river. Harman was eliminated in 18th place and secured her first cash of the 2012 WSOP. Ben Landowski began the final table as the chip leader with 574,000, though several players were nipping at his heels; in fact, everyone seemed to be a legitimate contender for the title. 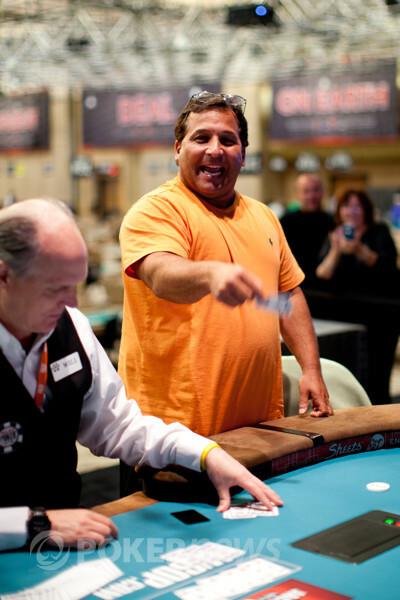 It took about an hour for the first final-table elimination to occur and it happened when Al "Sugar Bear" Barbieri raised to 40,000 and a short-stacked Lori Kirgan tossed in her last 38,000. Everyone else folded, and the cards were tabled. Kirgan managed to pair her king on the flop, but the running turn and river gave Barbieri a straight and the run. Kirgan finished in ninth place and took home $15,886 for her efforts. Not long after, Barbieri was at it again when he raised from the cutoff. Alex Queen three-bet on the button, Barbieri called and the flop came down . Barbieri check-called a bet from Queen, the turned, and Barbieri led out for 40,000. Queen had just a few thousand more and he committed them to the pot. Barbieri called, and the cards were tabled. The turn was a cooler card as it gave Barbieri the straight and Queen a set. Queen would need the board to pair to survive, but the river was the . Queen took home a $20,370 consolation prize. The next elimination occurred when Arsht put in a raise from middle position and was called by Jeff Weiss and Barbieri, who were in the small and big blinds respectively. Action checked to Arsht on the flop and he put out a bet. Weiss called off his last 7,000 while Barbieri got out of the way. Arsht was in the lead with a pair of nines, but the turn did give Weiss an open-ended straight draw headed to the river. "Here comes the king," Barbieri said. The dealer burned and put out paint, but it was the . Weiss collected his things and made his way to the payout desk to collect $26,401 for his seventh-place finish. After the dinner break, the cards seemed to turn on Landowski, who if you recall entered the final table as the chip leader, and he went on a downward spiral that lasted 30 minutes that ultimately resulted in his elimination in sixth place for $34,620. The next to go was Glenn Engelbert, a man that seemed to have nine lives in this tournament. Just when it seemed like his fate was sealed, Engelbert caught a rush of cards and put himself in contention, but it was cut short by a cooler flop that you can read about here. Eventually Engelbert became the fifth-place finisher and earned $45,953 for his performance. Four-handed play seemed to last forever, but the blinds soon forced the action and did so in a big way. Arsht raised it up and Donald Auger raised all in. Barbieri made the call with just 20,000 behind and Arsht put in one more raise to get Barbieri all in. He made the call, and the three players showed their hands. Barbieri had more chips then Auger and confirmed with the floor that he would get third place if both players lost the hand. Once he got that confirmation, he celebrated and started shadow boxing. "I love my hand,” he said. “I'm ready to triple up baby!" 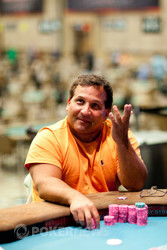 The flop silenced Barbieri, though he noted he could catch runner-runner clubs to crack Auger’s set. 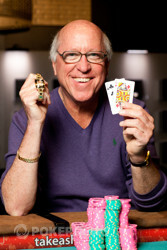 The made things especially interesting as it gave Barbieri his flush draw, but it also delivered Arsht a straight draw. Wouldn’t you know it, the slammed down on the river to give Arsht the straight and the whole rail erupted. Auger stood in disbelief while Barbieri started celebrating, even though he knew he lost the hand. "That's a $23,000 eight of diamonds right there," he said in reference to Arsht eliminating Auger in fourth place and bumping him up to third. Heads-up play was short and sweet as Arsht held a 5-1 chip lead over Stephen Hung. It took just six hands for Arsht to dispatch his opponent after both players turned trip queens. Lucky for Arsht, his kicker was best. Congratulations to David Arsht on capturing the Event 13: $1,500 Limit Hold'em title, his first WSOP gold bracelet and the $211,921 first-place prize. It was made all the more impressive considering he was down to just 4bbs at the start of Day 2! That does it for our coverage from Event 13: $1,500 Limit Hold'em. Be sure to visit our Live Reporting Section to learn which events you can follow as we continue to live blog the 2012 WSOP from the Rio in Las Vegas, Nevada. Wow. After a long time playing four handed, we have reached a speedy conclusion to this final table! Action started with David Arsht, and he raised it up. Stephen Hung called, and the flop came down . Hung check called a bet, and the turn was the . 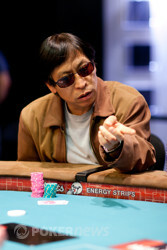 The two players got in a raising war that saw Hung get the rest of his chips in. The cards were flipped, and Arsht was miles ahead with one card to come. Both players had trip queens, but Arsht's ten kicker played. Hung would need a three to win the hand, or a jack or six to chop. The river was the , and Hung was knocked out. He will take home over $130,000 for his efforts. After a few hours where Al Barbieri was the only thing keeping the rail awake, we have just had a ridiculous hand that sent the whole rail and the players into a frenzy. David Arsht raised it up, and Donald Auger raised all in. Al Barbieri said "well I ain't missing out on this I'm in" and made the call, with just 20,000 behind. Stephen Hung folded, and Arsht put in one more raise to get Barbieri all in. He made the call, and the three players showed their hands. Barbieri had more chips then Auger, and confirmed with the floor that he would get 3rd place if both players lost the hand. Once he got that confirmation, he celebrated, and started shadow boxing, saying "I love my hand I'm ready to triple up baby!" Well the board couldn't have been written any better if someone was trying. The flop came down , giving Auger a set to take the lead. What could have been the perfect turn card? The sounds pretty good huh? That gave Barbieri a flush draw, Arsht a straight draw, but Auger was still ahead. The slammed down on the river, and the whole rail erupted. Auger stood in disbelief, while Barbieri started celebrating, even though he knew he lost the hand. He said "That's a $23,000 eight of diamonds right there!" When the dust settled, Auger took 4th place, Barbieri took 3rd, and Arsht scored the double knocked to get to heads up play. Action folded to David Arsht and he continued to apply pressure with a raise. Donald Auger defended from the big and even called a bet on the flop, but when Arsht fired on the turn, Auger shook his head and released his hand. David Arsht has not let his foot off the gas since we got back from the break, and he is starting to pull away from his three opponents. On the first hand Al Barbieri raised in the cutoff, and Arsht three bet in the small blind. Barbieri called, and the flop came down . Arsht led out, and Barbieri laid his hand down. The next time he was in the small blind, Arsht raised it up, and Donald Auger called in the big blind. The dealer fanned out a flop of , and Arsht continuation bet. Auger called, and the hit the turn. Arsht led out again, and this time, Auger raised. Arsht called quickly, and the river was the . Both players checked, and Arsht showed . Auger mucked face up, and Arsht took the pot. Arsht is now up to 1.9 million, while Barbieri and Auger are both under 300,000. Al Barbieri raised from the button and David Arsht defended from the big blind. The flop saw Arsht check and Barbieri bet. Arsht then check-raised and Barbieri looked perplexed. "Really?" the man known as "Sugar Bear" said. "Did you find a big hand in the big blind, David?" Barbieri then flashed the and folded his hand. Stephen Hung raised in the small blind, and David Arsht called in the big. The flop came down , and Hung bet out. Arsht called, and the turn was the . Hung check called a bet from Arsht, and the same thing happened on the river, the . Arsht announced "three eights" and showed . Hung mucked, and Arsht collected the pot to go up to 1.2 million, while Hung dropped to 500,000. The players are in their seats again, and the cards are back in the air.